Five years ago, Brian “Tat” Tatman (who grew up outside of Philadelphia) and his buddy Jason Simondejka (who hails from South Jersey) opened their Philly-style steak and hoagie shop, Tat’s Delicatessen, at 115 Occidental Ave. S. in Pioneer Square. It didn’t take long before word got out about their sandwiches. Their 15 tables filled. Lines formed. 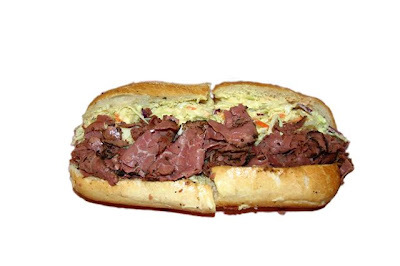 As did opinions about which was the better — Tat’s cheesesteak wit Whiz or the best-selling Tat’strami piled with pastrami, melted Swiss, sweet coleslaw and Russian dressing. 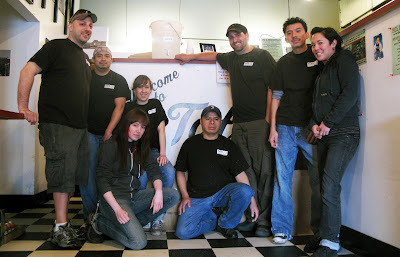 Owners Mike Sichel (far left) and Brian Tatman (in ball cap, standing third from right) with their crew at Tat’s Delicatessen, soon to be on the move. .
Tat told me it’s been a long while since he threw over our hometown-favorite, Amoroso’s (whose rolls he’d shipped in par-baked) and talked a local supplier into baking Italian-style rolls to his specifications (“We added cornmeal to give it that Italian texture”). Now with the new store, he’s throwing-over Philly-branded Dietz & Watson corned beef and pastrami in favor of Tat’s own product, brining and smoking the brisket in-house. Here’s the Deitz & Watson-ized Tat’strami — soon to be replaced with the house-smoked version. Can’t wait to try that one! . Customers who’ve taste-tested the new Tat’s-brand beef have loved it, he said. “It’s incredible. It’s going to be huge.” His hope is that the housemade version appeals to the New York corned beef- and pastrami-crowd. “And if there’s any crowd tougher than a Philly crowd, it’s a New York crowd.” Don’t I know it. Just last week I was singing the praises of a “real hoagie” in this post: giving props to the one I made a special pit-stop for on my way to my Aunt Rose’s house in Cape May, N.J.
Funnily enough, when I asked Tat which of the two dozen steaks ‘n “subs” he prefers (the latter is a moniker employed here in Pioneer Square — though it’s unlikely you’ll hear it in Philly or South Jersey), he sang the praises of the “Tat’s Italian” made with capicolla, pepper-ham, Genoa salami, provolone and hot and sweet cherry-peppers. “I can put it in the fridge and eat it for days and it still tastes good, because the flavors meld.” Which, by the way, is a sign of a great hoagie. I did the same in Cape May with my Italian classic. Half for dinner one day, half for lunch the next. That historic feel, he said, is something he was looking for after moving to Seattle from Pennsylvania in 1994 with a cohort of his Penn State pals: a group that now numbers several-dozen, many of whom live within walking distance of one another in West Seattle. “We’re our own independent family out here, and we’re continually bringing those people into the mix” at Tat’s. Before opening his sandwich shop, Tat “did the day-to-day grind in the corporate world,” working as a marketing manager for a telecom business during the go-go years. But slicing meats and serving customers at breakfast and lunch is what it’s all about today. While the original Tat’s was borne out of a need for a taste of home, the need for a bigger home is what’s driving the move to larger quarters. Stay tuned to Tat’s Web-site for more on the move. And note that once moved, hours will be extended (weekdays: 8 a.m.-7 p.m.; Saturdays 11 a.m.-7 p.m.; Seahawk Sundays: 3 hours before the game till kickoff).